﻿ Historic Clifton Mill - Ohio. Find It Here. Enjoy a visit to the Historic Clifton Mill to see how the Mill works, view and walk the grounds, dine in the restaurant, and take home products from our store!The Historic Clifton Mill is one of the largest water-powered grist mills still in existence. The first mill at this site was built in 1802 by Owen Davis, a Revolutionary War soldier and frontiersman miller. The mill was built in this location to take advantage of the natural power of the concentrated water funneled into the gorge. Owen Davis and his son-in-law, General Benjamin Whiteman also built a saw mill and a distillery. Soon a village known as Davis Mills sprang up. The Little Miami River powered five other mills that were built within a mile of Historic Clifton Mill: a woolen mill, saw mill, paper mill, barrel mill and another grist mill. 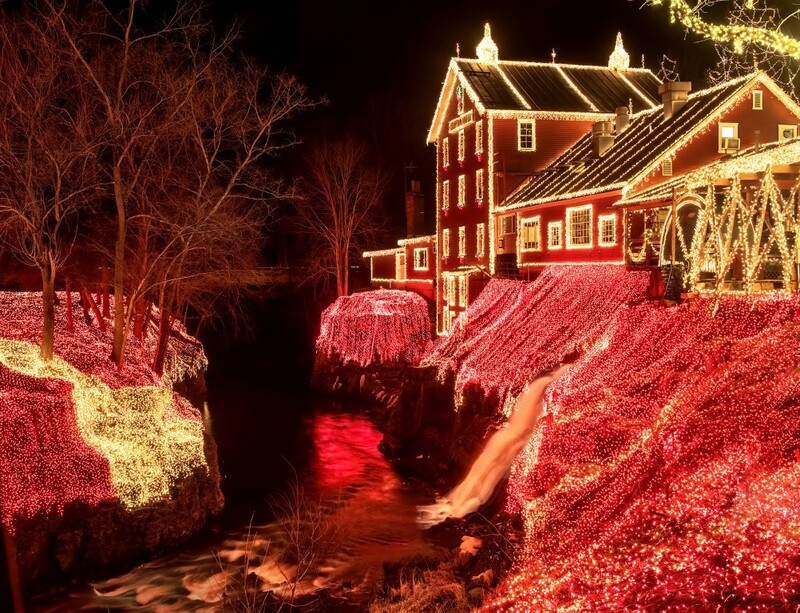 Historic Clifton Mill is the only one still standing.Historic Clifton Mill celebrates the Christmas Season with an extraordinary light display of 3.5 million lights illuminating the mill, the gorge, the riverbanks, trees and bridges. Enjoy and outdoor miniature village which includes replicas of a train station, moving light parade, diner, and drive-in movie. Look inside Santa's workshop while he works to get ready for the big day. View a fantastic collection of over 3000 Santa Clauses. Enjoy a musical covered bridge light show every hour on the hour. Display runs from Friday after Thanksgiving through January 1.